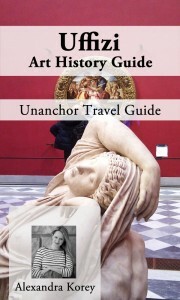 The experience of living in Italy and writing ArtTrav has led me to write a number of city and museum guides. A guide to the Uffizi Gallery written by an art historian using didactic methods of asking questions rather than just giving answers. My guide takes you through the famous museum room by room and points out which works are most important to pause and look at. For these works, I provide, name, title, date and photo, but the most important part of this guide is the text. I explain why the work is important in art history, help you spot interesting stylistic details, and help put it in context of what you see throughout the rest of the museum. *Update March 2015: I have taken the IOS guide off the App store because it is incompatible with IOS7. Thanks to this update I will have to re-do the app from scratch, so it may be a while; in the meantime the content is the same in the Kindle version below! This itinerary is designed with the first time visitor in mind. Three days in Florence, mapped out hour by hour, with an itinerary that includes churches, museums, but also restaurant recommendations and travel tips. This guide suggests a loose itinerary for a week in Puglia, specifically the valle d’Itria and also Matera (which is not in Puglia but in Basilicata). It makes up for a lack of good English-language guides to the area and is based on numerous personal trips there. As staff writer at The Florentine, we’ve written an app that guides you around Florence in the footsteps of the protagonists of Dan Brown’s latest novel, Inferno. 31 points are enriched with an audioguide and map, and of course provide extra historical information that you can’t get in the book. Get it here.